I didn't make this dress. My dear friend Heather has two little boys, and she found this fabric with smocking on one side that was begging to be made into a dress. She couldn't make a dress for her boys, so she made one for Abigail instead. Heather asked me for measurements, and we decided to use measurements just a little bit bigger than needed so Abigail can wear this dress for a while. So it's a smocked dress that can be a little tight, but is currently a little loose. And it's almost to her ankle right now, which gives her plenty of room to grow taller. We did this in part because Abigail is really small for her age right now, but could get a growth spurt at any time. It's not so easy to make dresses that it's fun for them to be outgrown immediately! The dress is a fairly simple construction, just a hem and a seam up the back, since the smocking was part of the fabric. The straps are the part that I'm most impressed with. Because we decided to make the dress a little big, the straps had to be made to grow also. So Heather added buttons to the dress and buttonholes to the straps. As Abigail gets taller, the straps can be made longer. Buttonholes scare me a little, so I'm especially excited about that feature. It's hard for me to get Abigail to stand still for photos anymore. She ran around the yard as I chased her for these shots. If you look close, you can get an idea of our shared fashion sense. She is wearing hot pink corduroy sneakers with her lime green polka dot dress. 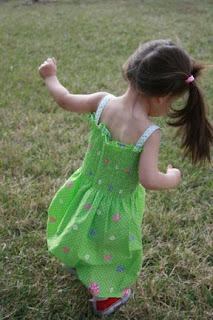 I'm a little obsessed with lime green polka dots, and Abigail likes combining dresses with practicality. Occasionally, it's my idea to pair her dress with a pair of pants (so she can go down the slide easier), but when given a choice of what to wear she'll often say "dress and pants." Thanks for the dress, Heather! We love it (and you). cute! i need to see oics of her face!